This photo of Shoreham was taken in the late ’50’s. That year a foreign ship (I think East European) was impounded in the dock, and searched by the drug squad, who found substantial quantities of narcotics. A sign of things to come for this country. When I was aged between 10 and 12 (mid 1960s) I would occasionally cycle to Shoreham Harbour (a fair trek from Coldean where I lived, but nothing like so much traffic on the roads) to watch the ships arriving and leaving. Two I recall were Sir William Walker and Charles H Merz (which I’ve probably not spelt correctly) – though I don’t know where they came from/went to or what they carried. Can anyone help? Hi John, I will try to find proof, but I have a pretty good idea, that the Sir William Walker was a Stephenson Clarke ship, delivering about 4000 tons of coal a time to the power station. I will be back. The Charles H Merz & Sir William Walker were owned by the Central Electrical Generating Board & managed by Stephenson Clarke. 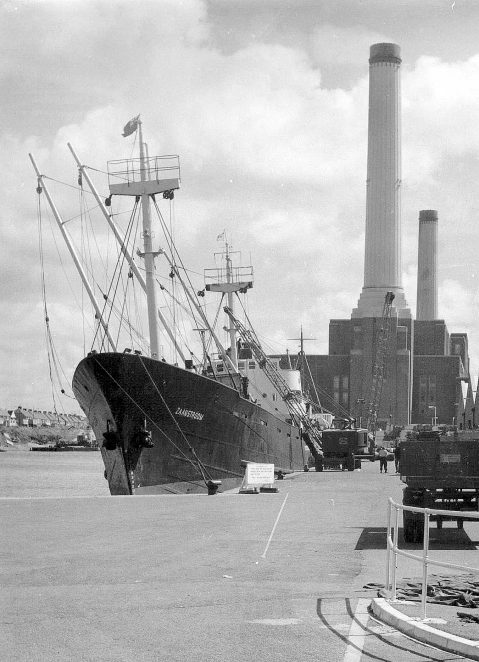 They were purpose built to carry coal from the North East Ports to the power station in Southwick. Their size was the maximum length for the Prince Philip Lock. They occasionally went to Ipswich and the Power Stations on the Thames. They were among the last steam powered ships in the coal trade. They were built around 1954-55 and had several near sister ships, the Sir John Snell, James Rowan, Sir Johnston Wright and the slightly older Cliff Quay, Barford & Captain J.M. Donaldson built around 1950-51 all had a gross tonnage of around 2,500 tons. Thanks Ian – I suppose that’s the logical cargo for these ships to have been carrying, though a little disappointing as I imagined them bringing something more exotic from far away lands! Now that you mention it, I recall seeing the Sir John Snell too. I used to live in Colebrook Road, Southwick, and spent many hours down by the locks and can recall when one of the two locks was enlarged to accommodate the larger ships mentioned above. The power station was being built at the time. Can recall some ships’ names such as the Seaford, Sand Baby many from Holland and all were quite small and many were registered at Goole. Testing the memory here but I can recall the two original locks plus the dry dock and remember the lock men using large stationary winches to open and close the locks manually. Another memory is of the small trawler haven next to the town hall where perhaps six or more trawlers moored. Further and quite another matter ,when I used to play along the green embankment, I am pretty sure it was somewhere along there that I found quite a few Roman coins. During the 1950s and 60s we used to spend summer holidays at my grandmother’s house in Steyning. I well remember seeing the Archibald Page and Sir John Snell discharging coal at the power station. Then I thought (and still do) that the Sir John Snell was a very handsome vessel. In the 1950s I belonged to Shoreham Boys Club – a gymnastics club. Initially we trained weekly at a school in Middle Road, before the club moved to an old church hall in Ship Street, I believe. Frankie Vaughan attended the opening of the new centre in Ship Street. Then when the new, enlarged, lock gates at Shoreham Harbour were opened by Prince Philip, I recall us boys putting on a gymnastics display. Our white shorts were pretty voluminous back in those days and I recall the Shoreham Herald quoting the Prince as having mistaking us for “girls in white skirts doing some exercises”. If anyone has photographs of the event I would appreciate copies as I have misplaced mine.